[German]Microsoft’s January 2019 updates are causing a network issue in all supported Windows 10 versions. A patch to correct the problem is expected in February 2019 or later. Here is some information about what is going on. After the installation of the security updates 2019-01 (KB4480116) the Telekom Router (Speedport 925) could no longer be reached. After deinstallation, the Speedport router could be reached [within the browser] without problems as usual. Some other German users mentioned DHCP issues within this forum thread. They recommended to assign a fixed IP address as a workaround. I haven’t tested this (because I’m not affected, currently my Windows 10 V1809 test machine can’t connect to Microsof’s update servers). 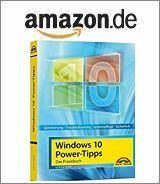 Then I came across the mentions here and here by chance and started to consult Microsoft’s kb articles for all Windows 10 updates from January 2019. Update KB4480977 for Windows 10 V1607 and Windows Server 2016, dated January 17, 2019 doesn’t mention the issue. Also update KB4480116 from January 8, 2019 for Windows 10 V1507 doesn’t mention the issue. It’s not clear whether it is only a lack of documentation or if the error has been fixed. Within the kb articles mentioned above, Microsoft added (probably at January 17, 2019) the following ‘known issue’. The above KB number belongs to the article for Windows 10 V1809 update and changes depending on the Windows 10 version. Microsoft proposes the following steps as a workaround to enable access to local sites in Edge browser. 1. Open the Control Panel (enter control within taskbar’s search box, and click the control panel item shown within the start menu) and select Internet Options. 2. On the Security tab, select the Trusted Sites icon and click the Sites button. 3. Clear the check box for Require server verification (https:) for all sites in this zone. 4. 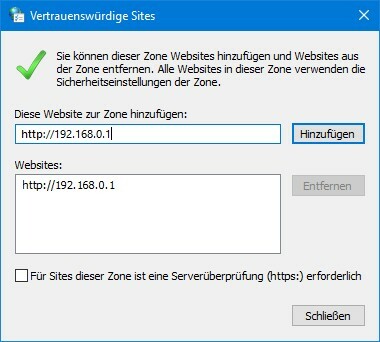 In the Add this website to the zone: box, type the local IP address that failed to load, such as http://192.168.0.1 and click the Add button. 5. Select again the checkbox Require server verification (https:) for all sites in this zone, then confirm the Close button. Then click the OK button to close the property page and restart Microsoft Edge. Afterward the local websites should be reachable within Microsoft Edge. Microsoft is working on a resolution and will provide an update in an upcoming release. This entry was posted in issue, Update and tagged issue, Network, Update, Windows 10. Bookmark the permalink. A German blog reader left a comment decribing his tests – he was able to reproduce the Edge local website issue. He ran a lot of tests – here are his findings (I’ve translated it into English). Could reproduce the issue just in the Edge – the web interface of Fritz!box (router) can’t be reached, neither by IP nor by fritz.box. No problem in IE. – An IP address in a private address space can be accessed if the address space of the target differs from the address space of the PC. Almost had a DNS-over-HTTPS failure in mind, but… that doesn’t fit with the fact that an internal web server can be addressed via a local “public domain name” and that the local domain can still be addressed under its name. And so it does not match the error of not being able to address web servers in one’s own network via IP address. I had not had any problems with my systems but my 12 year old niece, who rarely talks to me any longer unless she has computer problems at which point she becomes very talkative, called me to complain about her gaming laptop not connecting to the Internet. It had recently updated and she became disconnected. I finally came to the conclusion that assigning a static IP fixed the problem but that is problematic for her in the long run because she takes her laptop over to friends homes. There were also issues with her “Steam” games not working and not being able to upgrade to 1809 as a possible fix. After spending several hours at work with the laptop running virus scans and other checks, I re-installed 1803 and everything started working again including “Steam”. That is until the system (Home, I mean Guinea Pig, Edition) insisted on installing patches at which point it stopped working again. I upgraded her to Professional and deferred future updates for several weeks but I still have more work to do. Possibly removing all of the recent patches or biting the bullet and upgrading to 1809 if it lets me. Honestly I am getting sick and tired of this patch “carp”. I am 56 and have been fixing busted systems for almost 30 years now and it is getting tiring. Even Apple is no longer a safe bet as garbage iOS releases come out (I still run 10.3.3 because too many associates got burned with iOS 11 and every time iOS 12 updates come out there is something potentially bad with it). I wish the software companies would stop issuing releases based on a calendar date and instead focus on releasing a product when it is ready. Throwing a buggy product into the wild because the calendar says so and then letting people like me deal with the consequences is really pi$$ing me off. This fixed one new issue. The other is that streaming tv videos will not display. This is new in the last couple days.